Ellen Butler is another Photo Exchange member who was juried into the annual members exhibit at 2nd City Council Gallery in Long Beach (CA). This exhibit will be opening Saturday, June 7 th. 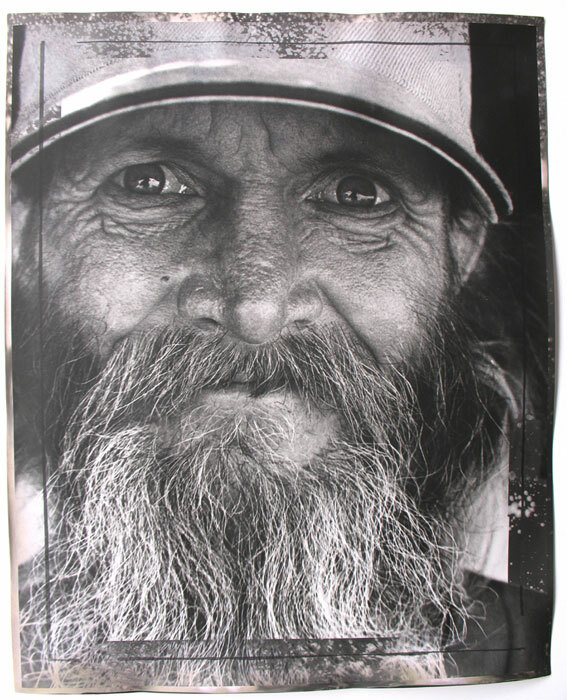 The photograph is a 20″ x 16″ Silver Gelatin fiber Black and White, captured with Tri-X. Bob is a homeless guy I’ve noticed for the past few years as he is always on the corner of 7th and PCH in Long Beach, right by the small coffee shop with the huge doughnut that looms over it. He waves at everyone who drives by; what really caught my eye is how much like a sign of benediction his wave is. I finally screwed up the courage to ask him if I could take pictures of him. I first shot him about a year ago; this image was shot this month. Bob has the most beautiful eyes and what struck me from the very first time I tripped my shutter, is the truth of that expression, “the eyes are the window to the soul.” After many conversations with him I am keenly aware, Bob is more in present time than most people I know, and he is the most wonderful and gentle man. Thanks for sharing your photo of Bob and your thoughts about him. Your photo of Bob is captivating. Ellen you have captured and expressed, through photo, the integrity and beauty of a homeless man and shared it with the world. How many have ever stopped long enough to look him in the eyes? Like always Ellen see’s what most of us miss! She saw into my soul 25 years ago…left her gentle mark there, and to this day her words still remind me of who I really am….no matter what! Thanks Ellen! GREAT PHOTO! Ellen, is it you? the EB that guided our creative minds through high school. If so , this is your long lost student form Mesa 1988. I have wanted to touch base with you about art and photo ideas. PLease respond. This is Miles Conrad- affiliated with Conrad Wilde Gallery in Tucson, AZ. You visited the gallery and acquired one of my pieces in 2005. I am planning to participate in the 2nd City Council LGBT show. I just wanted to contact you to touch bases since I am thinking of visiting Long Beach for the show. It’s great to see you are still capturing the essence of life. It’s even cooler to see the West Side pictures now that I live on the east coast! Meg? Meg! I never look at this blog but just did. I don’t think I saw your comment before or responded. If you see this, write to me at eebutler@charter.net. I’d love to re-connect and hear what you’re doing!